NBA teams set lofty goals every season, but those expectations won’t be reached unless a critical member of the roster performs up to his ability. What defines a successful year isn’t the same for every player, though. Not all top-tier talents are a team’s defining piece. Someone like Kemba Walker, for example, is an All-Star on a middling franchise. Some teammates have more to prove. There are stars who need to live up to a lucrative contract, excel in a new destination or recover from a disappointing year. Elsewhere, young standouts are aiming for stardom and impending free agents need to prove their worth. Still, individual development is key to team success. And in some arenas, that X-factor could spark a deep postseason run. Atlanta fell in love with Trae Young’s two elite traits. The point guard’s shooting range is special, and he sees the floor extremely well. However, the Hawks needed to weigh those assets against below-average height, a slender build, propensity for low-percentage shots and occasional carelessness with the ball. That’s an extensive list of downsides for the No. 5 overall pick in the draft. Nobody should be expecting Young to elevate a bad Atlanta roster immediately, and his audacious style is atypical for the NBA. Will he become an exception to the rule? Kyrie Irving was tired of playing second fiddle, so the All-Star guard forced his way out of LeBron James’ shadow. During 60 healthy appearances in 2017-18, Irving showed he could carry Boston. But the unhealthy portion of his debut Celtics happened at the wrong moment. He wasn’t available in the playoffs, and Boston’s need for a reliable shot-maker on the perimeter flared in the Eastern Conference Finals opposite Cleveland. Now healthy — along with Gordon Hayward — Irving will be orchestrating an offense that can be among the best in the NBA if he excels. Given the status of the East — not great, Bob! — Brooklyn has a real chance to make the postseason. Reaching that ceiling mostly depends on D’Angelo Russell taking a big step in his development. Injuries have hampered the point guard’s progress, causing him to miss 53 games since 2016. Before a left knee contusion in 2017-18, though, he tallied 20.9 points on 46.3 percent shooting with 5.7 assists. Annual All-Star or not, that’s an impressive line. Russell, who is entering the final year of his contract, must regain that form to benefit himself and the Nets. The last few months haven’t been Malik Monk’s greatest moments. In addition to being cited for reckless driving, the second-year guard dealt with a fractured thumb. That all followed a rookie campaign where, despite backing up his potential in spurts, Monk largely was a non-factor. He mustered just 13.6 minutes per appearance and shot only 36.0 percent from the field. By no means is this a make-of-break year for the Kentucky product, but Monk needs to solidify his spot in the rotation with more consistent contributions on offense. Milwaukee would’ve preferred to receive a return for Jabari Parker, but determining how much to offer the restricted free agent was complicated. The injury-prone forward isn’t quite a primary scorer, and his defense is a problem. Still, Parker’s best showings on offense suggest he could become more than a secondary weapon. Chicago decided it’d give Parker two years and $40 million to find out the answer. Although the Bulls have a handful of promising pieces, they’re not a definite playoff contender. Parker, at his best, could boost Chicago to that level. The departure of LeBron James is not good for Cleveland, let’s not get that twisted. However, the 2018-19 season will provide the first extended look at Cedi Osman, who appeared in 61 games as a rookie but wasn’t a factor in the playoff rotation. There’s a ton of excitement about his potential. Osman averaged 20 points, 8.0 rebounds, 4.5 assists and 2.5 steals in Summer League and was consistently a high-energy defender. How will that translate to a significant regular-season role? We can’t be sure, but Osman is about to show us. Dallas Mavericks: Dennis Smith Jr. While most attention on the Mavericks is focused on rookie Luka Doncic, the team’s second-year star has a fascinating outlook. Dennis Smith Jr. averaged 15.2 points and 5.2 assists, but the roster is quite different compared to last season. Dallas drafted Doncic, signed DeAndre Jordan in free agency and has shifted Dirk Nowitzki to a bench role. Smith will still dictate the offense plenty, yet he must adapt to an off-ball spot when Doncic handles the rock. Smith only shot 31.3 percent from three as a rookie, so that must improve. This is a tricky, critical year in his development. Following his MVP-caliber year in 2016-17, Isaiah Thomas said the Celtics would need to bring a Brinks truck to re-sign him. Even if Boston didn’t pony up, at the time, the quote seemed reasonable. Instead, a hip injury ruined his brief stay in Cleveland, and the free-agent market wasn’t kind to Thomas. He inked a one-year deal with Denver on the veteran’s minimum — no Brinks truck needed. But the Nuggets are a terrific spot for Thomas to rehabilitate his health, image and value. If he bolsters the bench for a playoff team, Thomas will find plenty of suitors next summer. The high-flying, rim-shaking athlete that captivated the NBA is gone. The current edition of Blake Griffin is a complete offensive player, though. He became a relatively efficient, high-volume three-point shooter with a 34.5 mark last year. Additionally, Griffin’s average of 5.8 assists was a career-high — and he dished 6.2 per game in 25 appearances with Detroit. The 29-year-old is a terrific facilitator and can provide spacing. Still, his long-term fit next to Andre Drummond is curious. Can Griffin be the playmaker Detroit needs to reach the postseason? With or without DeMarcus Cousins, Golden State would be the favorite to win the NBA title. A healthy quartet of Kevin Durant, Stephen Curry, Klay Thompson and Draymond Green ensures that billing. DeMarcus Cousins, however, needs a year to rehabilitate his value following a season-ending Achilles injury. The center found a shallower market than anticipated in free agency, so he decided to chase a ring on a one-year contract with Golden State. Cousins established himself as a dominant center thanks to elite athleticism, but he needs to prove he’s still that player post-injury. It’s clear Carmelo Anthony cannot be the featured player of a championship-caliber team. But as a complementary scorer for Houston, he could be a weapon. As was the issue in Oklahoma City, though, Carmelo must accept the reality he’s no longer a No. 1 scorer. Entering the year, it seems he’s done so. That’s a critical development for Houston, which lost both Trevor Ariza and Luc Mbah a Moute in free agency. The Rockets are thinner on available wings — and much thinner defensively — but Anthony could atone for part of those departures with his shooting. During the first round of the 2018 playoffs, Indiana outscored Cleveland by 40 points over the seven-game series. However, the lack of a true secondary scorer doomed the Pacers when Victor Oladipo struggled. Tyreke Evans is supposed to fill that void. Last season, he averaged 19.4 points on 45.2 percent shooting while occupying a leading role in Memphis. Given the Pacers’ reliance on Oladipo, nothing will have changed if Evans doesn’t match that level of performance. But if he does, Indiana will be a thorn in the Eastern Conference. Part of the return in the trade sending Blake Griffin to Detroit, Avery Bradley had a horrid end to the season. The swingman appeared in only six games for Los Angeles, averaging 9.2 points while shooting 11.1 percent from three-point range. Abdominal injuries ended his season, but the Clippers still signed him to a $25 million deal this summer. That’s a considerable level of faith in Bradley, who’s known as a 3-and-D player. If he regains his previous form, the Clips are a playoff contender. Otherwise, they’ll be leaning on a whole bunch of youth to replace him. LeBron James carries a massive burden of expectation into the City of Angels, but the four-time MVP has nothing to prove. Suggesting otherwise would be foolish. However, the Lakers signed Rajon Rondo despite having Lonzo Ball. It’s uncertain which point guard will start, and Los Angeles must ensure Ball’s development isn’t being inhibited because of Rondo’s presence. Conversely, if the Lakers choose to feature Ball, Rondo must be willing to focus on serving as a veteran leader. When the playoffs arrive, he’ll be valuable. Navigating any frustration in the regular season will be the trick. The last time Memphis made a marquee free-agent signing, it turned into a $94 million disaster in Chandler Parsons’ contract. Kyle Anderson’s price tag isn’t near that level, but the Grizzlies ponied up to pluck the forward away from the San Antonio Spurs in restricted free agency. Throughout his career, though, he’s been little more than a complementary piece and isn’t a perimeter shooting threat. Anderson’s passing and intelligence make him a clear member of the rotation, but the Grizzlies must be careful not to expect large contributions outside of his skill set. Hassan Whiteside is a reasonable choice, since his contract is close to being viewed as dead weight on the cap sheet. Barring a trade, though, the Heat are locked into Whiteside through 2019-20. On the other hand, Justise Winslow will be a restricted free agent this summer if he and the Heat don’t agree to an extension. What complicates the discussion is Winslow still doesn’t hold a defined position. His versatility is an asset, but eventually, he needs a consistent role. Without that, Winslow will remain mostly a projection despite his four years of NBA experience. Eric Bledsoe arrived in Milwaukee via trade with exciting potential. However, the Bucks flamed out during the playoffs. Since then, new head coach Mike Budenholzer has installed an offensive system predicated on rapid ball movement. Bledsoe is capable of spending less time on the ball, and adjusting to that style would also solidify long-term value. He’ll be 29 years old as a free agent next summer, so that contract will probably be his last high-dollar deal. If the Bucks can count on Bledsoe in the backcourt, it’ll boost an intriguing roster around Giannis Antetokounmpo. Regardless of Jimmy Butler’s involvement in Minnesota, 2018-19 was always going to be a critical year for Andrew Wiggins. After four seasons, he’s been a moderately efficient shooter who lacks above-average impact as a passer, rebounder and defender. Someone getting paid $25 million-plus per year needs a secondary elite trait, and Wiggins has showed little sign of developing one entering his age-24 campaign. Perhaps that changes this season, and the Wolves would be thrilled. But if not, they may begin exploring how to attach a draft pick and dump his salary. The Lakers’ successful pursuit of LeBron James pushed Julius Randle out the door. The versatile forward landed with New Orleans on a two-year contract worth $18 million. Randle gives the Pelicans a fascinating group of options in the frontcourt, which revolves around Anthony Davis. Randle is a smart passer and capable rebounder, so he’ll provide regular value. The big question is whether he can anchor a defensive unit next to Nikola Mirotic when Davis leaves the floor. Doing so would allow the Pelicans to avoid giving extra minutes to mediocre bigs on the bench. Emmanuel Mudiay is running out of chances to show he’s anything more than an unremarkable backup. In 165 appearances with Denver, Mudiay dished 4.3 assists but mustered a 37.4 shooting percentage. Though he’s steadily cut down on turnovers — basically cutting them in half since his rookie year — Mudiay doesn’t command any respect as a perimeter threat. He trudged to a 19.6 three-point clip after being traded to the Knicks midway through 2017-18. Unless that changes, he won’t garner much attention as a rotational piece in the future. When it comes to low-risk signings, Oklahoma City made perhaps the best addition with Nerlens Noel. The sixth overall pick of the 2013 NBA draft, Noel had a decent start in Philadelphia before getting dealt to the Mavericks. Put simply, it didn’t work out. Noel once seemed like a max-contract possibility but is now playing on a deal worth the veteran’s minimum. If he doesn’t pan out, no harm done to the Thunder. However, the springy 6-foot-11 center has elite shot-blocking potential at his best. With no other such player on the roster, OKC is hoping that materializes. Orlando found itself in a tough spot this offseason. Aaron Gordon is clearly talented, but the Magic needed to determine whether he’s a cornerstone for the future. Since he was a restricted free agent, Gordon was bound to receive a high-dollar offer. Orlando managed to bring him back on a deal worth $76 million guaranteed over four years, a relatively cheap price for the versatile 23-year-old. But the prove-it time is here. While Gordon has increased his scoring and assist output in each NBA season so far, his efficiency must climb to be a true centerpiece. How could any other Philadelphia player be the choice? The 76ers traded up to select Markelle Fultz at No. 1 overall in the 2017 NBA draft, and visions of a dynamic backcourt pairing with Ben Simmons immediately appeared. However, a shoulder injury robbed Fultz of a healthy rookie year. He ultimately returned late in the season but was a non-factor during the playoffs. 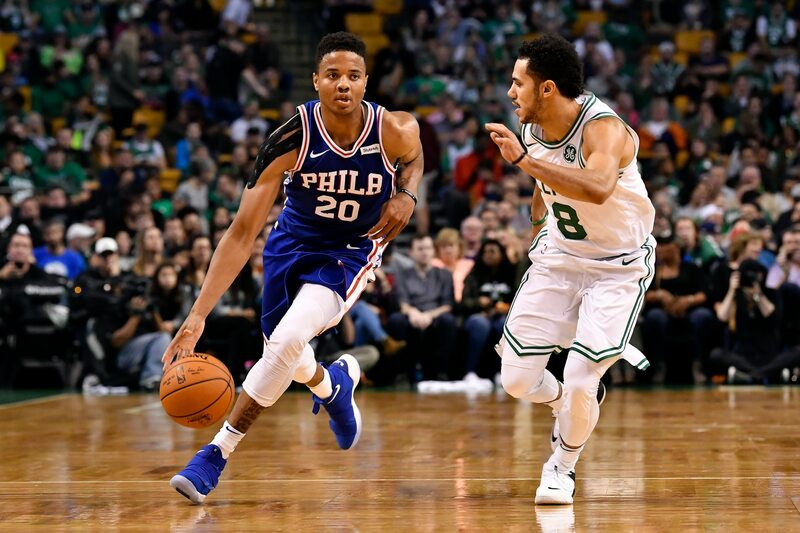 Fultz has great vision and passing skills, but he can also provide an intriguing off-ball complement if his shooting form and confidence have returned. The NBA world is eagerly awaiting that answer. Prior to the All-Star break during his rookie campaign, Josh Jackson offered a quiet average of 11.2 points while shooting 40.6 percent. Not great, not bad. Following the NBA showcase, though, the Kansas product turned in a remarkable stat line to end the season. Jackson registered 18.7 points with a 43.8 percent mark, adding 5.9 rebounds and 2.5 assists per game. Failing to match those numbers in 2018-19 isn’t reason to call that surge a fluke, but the Suns won’t rise much in the West standings until Jackson is consistently that type of player. While the decision didn’t register a major impact on the national radar, the Blazers chose not to bring back Ed Davis this offseason. He’s not a household name, but Portland grabbed 2.2 percent more rebounds with Davis on the floor, per NBA.com. Zach Collins must be ready to absorb that reserve role in 2018-19. As a rookie, the Gonzaga product did a serviceable — if unspectacular — job on he glass. At only 20 years old, Collins has plenty of time to develop physically. Portland, however, is banking on that progression to happen quickly as he fills Davis’ minutes. Willie Cauley-Stein recently voiced his goal of a massive payday this summer. That’s a terrific ambition for the impending restricted free agent. But if he wants big money, the center must show on a nightly basis that he deserves it. Cauley-Stein averaged a career-best 12.8 points last year, yet in 25 appearances that ended below 10 points he managed double-digit rebounds just once. So, even when he wasn’t scoring, he rarely atoned for it elsewhere. Cauley-Stein emerging as a star would solidify a dangerous frontcourt, but the opposite is a high-risk free agent. DeMar DeRozan ended his Raptors career as a team legend, leading the franchise in games played and points scored. Now, he’s starting over. As the centerpiece of the Kawhi Leonard trade, DeRozan will be expected to shoulder a hefty load beside LaMarcus Aldridge. But the Spurs also lost Danny Green in that trade, Tony Parker to Charlotte, Manu Ginobili to retirement and Dejounte Murray to a torn ACL. A once-outstanding backcourt is suddenly extremely thin. DeRozan’s performance will shape whether San Antonio’s 21-year playoff streak continues. During the 2016-17 season, Kawhi Leonard finished third in MVP voting. If he regains that form, there’s no concerns here and the Raptors could win the Eastern Conference. The 27-year-old posted 25.5 points, 5.8 rebounds and 3.5 assists with 2.5 combined blocks and steals per game during his most recent healthy year. That’s nothing short of sensational. Toronto is convinced Leonard has completely recovered, which is excellent news for him, the team and fans of great basketball. But after refusing to play for San Antonio last season, we’ll need to see him to believe it. The team clearly believes in Dante Exum’s potential. This offseason, Utah signed the Australian to a three-year contract worth $33 million. While a reasonable decision, Exum’s four NBA campaigns have included a torn left ACL that sidelined him in 2015-16 and a shoulder injury that limited him to 24 total appearances last season. By no means is a backup guard with career-high averages of 8.1 points and 3.1 assists a proven player. The Jazz should return to the playoffs as long as Donovan Mitchell is healthy, but they’ll need an improved Exum to truly affect the West. Dwight Howard has a reputation of being a plague in the locker room. Fair or not, the more important question to the Wizards is whether he can consistently provide a dominant presence near the rim. Signing Howard was a gamble, for sure. But given the other options in the frontcourt — particularly after an odd trade sending Marcin Gortat to the Clippers — Howard is a worthwhile risk. In addition to decent post-up defending, his greatest value should be as a pick-and-roll finisher with John Wall. But if that doesn’t happen, the Wiz won’t be anything special.